BIOPAC Multi-Subject Monitoring Systems revolutionize the way video data can be recorded and synchronized with an MP150 Research system! The physiological data and video data recorded with the camera systems will be linked for analysis and review. Simply scroll through either the physiological data or video and watch the corresponding linked data move to the same location. 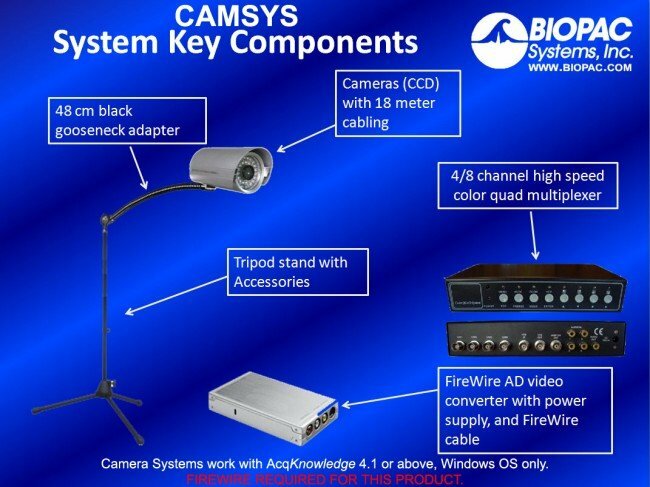 BIOPAC Camera Systems include multiple CCD-based digital cameras, color quad multiplexer, firewire box, plus tripod stands with gooseneck positioning arms, and cables for connection to your lab PC. Camera Systems work with AcqKnowledge 4.1 or above, Windows OS only. FIREWIRE REQUIRED FOR THIS PRODUCT. Multi-Subject Monitoring Systems are available with four or eight cameras and can be upgraded.